Bridgeton fishing dock is along the Neuse River. The pier is 120' feet in length and sits parallel with the shoreline. The Creekside Park fishing dock is along Brices Creek. The dock is about 275' in length, minus the areas allocated to hand launching of kayaks. The park has a picnic pavilion and a playground also. 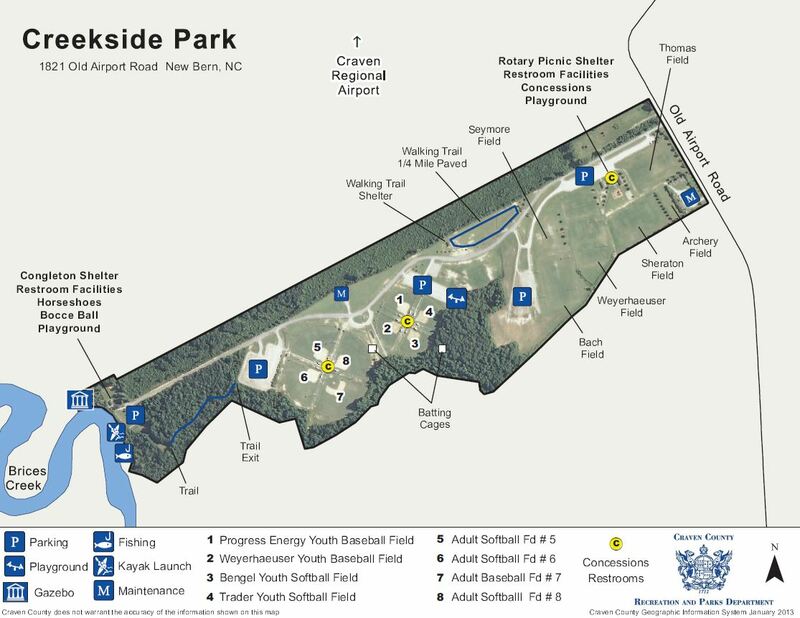 Creekside Park is large, the area near the water is at the back of the park. The Glen Burnie Park fishing pier is 170' in length over the Neuse River. No ther amenities at this park. No restroom facilities. A boat ramp on site also. The Latham Whitehurst Nature Park fishing pier is along the Upper Broad Creek. The Park offers; picnic pavilion, and a couple of restrooms, one is fairly close to the pier area, hiking trails & observation deck. Hand launch your kayak here also. You may want to bring a cart to transport your kayak(s) to the water, it is about a 3000' long trail! The fishing piers are over Lawson Creek. Pier 1 is 155' in length. Pier 2 is 100' in length. Picnic pavilion & restrooms are available. A Boat ramp is within the same complex also. The Lourenco Park fishing pier is along Lawson Creek, The pier is about 40' out over the water and there is a 30' x 10 deck at the end. There is also a kayak launch at this park. No restroom facilities. Areas in Craven County, North Carolina include; Adams Creek, Bridgeton, Brices Creek, Cherry Point, Cove City, Dover, Fairfield Harbour, Fort Barnwell, Harlowe, Havelock, James City, Neuse Forest, New Bern, River Bend, Trent Woods and Vanceboro. Bodies of brackish and saltwater in Craven County, North Carolina include; Adams Creek, Brice Creek, Bridge Creek, Cahoogue Creek, Clubfoot Creek, Courts Creek, Delamar Creek, Dolls Gut, Duck Creek, Godfrey Creek, Hancock Creek, Intercoastal Waterway, Kearney Creek, Kellum Crteek, Long Creek, Mortons Mill Ponds, Neuse River, Old Town Creek, Reeds Gut, Slocum Creek, Still Gut, Swift Creek, Trent River, Upper Broad Creek and Wilson Creek.